When I first moved to Texas I had a clever job in what used to be called alternative school. Twice a day the school turned off its lights, lay down and listened to a cassette of my friend Vicki Jones leading us through a series of progressive relaxation tense and release, in the background was the sound of slow surf. I’ve never been much of a beach type, but Vicki left a warm association with the sound of waves turning over. This morning after a somewhat arduous night at the Recanto Park Hotel (a cultural gaff, I didn’t understand how the a/c worked and in the middle of the night a red light began flashing. Don’t bother there isn’t a phrase anything close to that in the book) I wrestled the wake-up call at 5:30. We went down to breakfast and sat on our luggage waiting for our car to the airport. Colorful buses filled with Argentine families carrying thermoses of hot water for their mate left for their day at Foz do Iguacu, or Paraguay. Iguacu has a pleasant small airport. No one suspects you may be a sleepy terrorist. Travelers walk out to their planes on a painted lane of tarmac. The person seated next to me had terrible body odor, a scent days of sweating without showering, old laundry and coffee can make. He was traveling with a woman who had my sympathies for any proximity of intimacy. The flight wasn’t nearly full so I moved to a vacant window seat and retired into Infinite Jest as soon as the lakes and terraced hillsides disappeared beneath clouds. When I looked up Rio was coming into view. I tried to get myself on point for a major cosmopolitan city. The litany of warnings friends and articles gave about pickpockets, thieves, cutpurses and general South American criminal behavior clattered through the slow slot machine of my morning’s mind. Generally I don’t care much; I’m never worth much more to a thief than mutual annoyance. Besides I was surrounded by a group of Japanese tourists, whom I would rob for cameras were I in that trade. Try as I could, I just couldn’t wake up to full terrier alert. Really I would have been just as happy to be back in my flying cocoon reading about depraved tennis players and having the flight attendant bring be chocolate cookies and purified water. But such are the odd demands of tourismo. I am ever like a dog, ready for long, pointless meanders. Carol doesn’t share my enthusiasm to be off leash, she was fatigued and grumbly after our long fruitless walk to find Manoel E Jaoquim. (After several dozen erroneous quartos we found it, but it was closed on Monday). Instead we had lunch at a different pleasant sidewalk café where the waiter immediately brought us translated menus. La Doctora ordered bean broth and fried cassava. She said it was one of those vegetables described as a perfect food. I ordered bean soup as well and sardines. There were misunderstandings or mistranslations. Carol’s order arrived as she requested. They were generous with the fried cassava. The waiter brought me four perfectly grilled sausages, a piece of garlic bread and no soup. When I asked for my soup and sardines, the waiter brought me a ladle and an empty bowl pointed at la Doctora’s soup and insisted I ordered sausages, linguica. They were small and I held out hope that they might be sardine sausages. They were tasty anyway, especially with piri piri . Following lunch the clerk assured us the room was only two hours away from being properly prepared. We asked for directions to a nearby bank. He made the same magical gesture said “right, right, left” and off we went. It was the wrong bank. I got trapped in an electronically operated bulletproof revolving door. Quite apart from any guide book or article I decided it was culturally appropriate to assume uniformed persons casually pointing an automatic weapon can determine my directions to anyplace. Before the afternoon was over at least four gentlemen each with shaved heads, each holding a very impressive looking firearm told me my destination was four or five quartos, made the same magical gesture with their hand as the desk clerk, smiled, and said “Welcome to Brazil.” We needed to change some currency, which is a relatively easy task except in the United States where natives look at foreign currency as if it were counterfeit monopoly money, and it seemed Brazil. After talking to a French ex-pat and another bank guard I found a cambio inside of a place called Wizard. Magic can be made to happen anywhere. Fortunately for me la Doctora is fond of bodies of water, after an hour or so walking four or five quartos at a time I could sense a certain reluctance from her to go on. It was my (and our) good fortune to be only a couple of quartos from the brilliant light reflecting off the beach. Our promenade ended back at the hotel. The room was ready. The clerk went himself to check. It was a high ceilinged room on the tenth floor with french doors opening to a terrace overlooking the beach, worth the wait. My beloved opted for an understandable short nap. I changed into my running shorts. 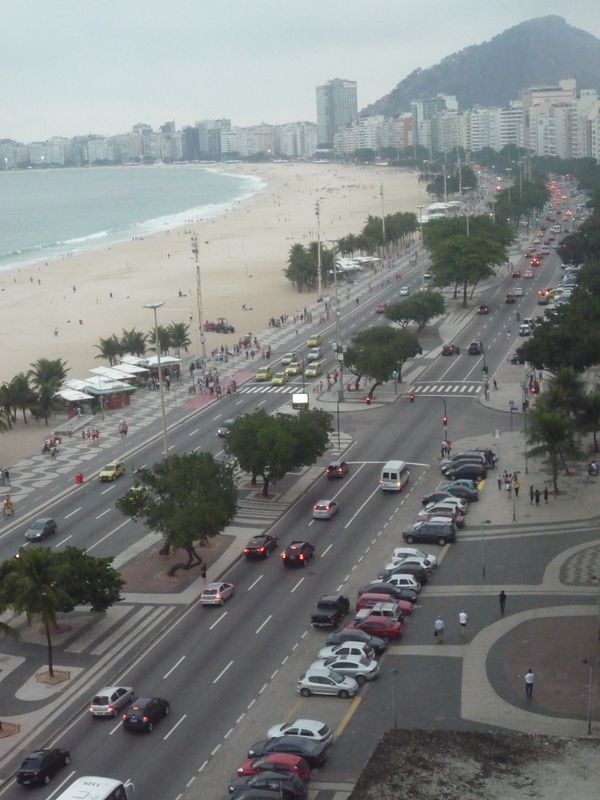 Copacabana Beach and Avenida Atlantico follow a three mile arc with the ocean on one side and a wall of hotels on the other. Most of the hotels are modern towers. It’s home to the famous Copacabana Palace, currently being refurbished. It’s a legendary stretch of waterfront. It’s as gorgeous of a beach as I’ve seen. Since it’s winter, it wasn’t crowded. The Atlantic is still too cold for any but the insanely determined swimmer. A few families sauntered along the promenade. Children played soccer in the sand. Couples rode rented bicycles. I took my run in the bike lane. It was a relief to have no direction to think about beyond how far I felt like running. I trotted down to the fortress and back. Although I inhaled too many diesel fumes (as if there were an amount that wasn’t too much) the air was salty and humid, a prescription for a person who had spent too much time in airplanes in the last week. I ran along easily exchanging thumbs up with other runners and a wave from a guy leaning out a bus window who mistook me for someone he knew. This was joggers paradise, no one even wore watches let alone ones capable of recording splits and laps. We were all happily drifting towards some measure of health. When I returned to the room the terrace doors were wide open, the sun was an hour or so away from setting. I stood sweating on the terrace watching the sky turning pale pink. I showered, rinsed out my running clothes and hung them discretely on the terrace to dry. A sleepy Doctora told me she had no desire to leave her spot in bed. I wrote for a while and briefly fell asleep at the keyboard. When I awoke, Carol refused to wake. I dressed and went out to stroll in the fresh dark washing up on the beach. I passed small beachside cafes along the promenade selling, coco verde, beer, snacks and pizza in a cup. The beach itself is lit by banks of lights, so there were dozens of football matches cheerfully passing and stealing. Young kids planted flip-flops for goals and chased the ball. Three young men were taking turns doing pull ups on a chrome apparatus. The sidewalk edge was filled with displays of scarves, jewelry, tee shirts, beach towels, carvings, and twenty varieties of glowing statuettes of Christ, all for sale. Families walked along, hand in hand, mothers with their arms around daughters, father’s laughing at their son’s greed. A man with a misshaped foot was folding palm leaves into grasshoppers for a fee. The throaty hum of Cesaria Evora was like a night blooming vine entwining one passing conversation with the next. I came to an old man in a worn brownish shirt selling popcorn, picocada, my favorite snack. He let me have a bag for three reales. I walked and ate. It seemed like I was the only person walking and eating. It seemed everyone, but me, knew if you don’t have the time to sit and eat, if you don’t have a few moments to sit over your coffee, you’re wasting your life. Nearby a samba quartet was ending their first gig of the night. As they left, we walked along together. They laughed with one another. As we passed a bar playing music, one of the musicians slowed and played along with such casual ease his playing was indistinguishable from the recorded song. His friends called him, he looked up, laughed and caught them up. They had many more sambas waiting before they went to bed. And I had bed. Tuesday afternoon I was feeling energetically nervous. I’d run, written for a couple hours and soaked the dried Fava beans for tomorrow. It seemed a perfect time to visit the MFA for an hour or two. It advertised its current shows with images of Frida Kahlo, Rembrandt, and Buddha. Big museum shows are not infrequently hokum to lure families in by association with the ever shrinking collective cultural knowledge. King Tut is like Elvis, his corpse and effects keep showing up someplace else with a new set of hits. The last Titian show was $15 to see five paintings. I’m fond of Venetian painting from that period and have written a painfully long ekphrastic poem about Tintoretto, but $15 for five paintings seemed excessive even by peep show standards. As I suspected there was only one Kahlo and one Rembrandt, famous paintings both, but singles. Both Frida Kahlo and Rembrandt’s paintings were featured, not as individual pieces, but as parts of more impressive collections. They were and are statements of curatorial taste. The Kahlo is from the Eduardo Constantini collection of Buenos Ares and the Rembrandt is on loan from The Kenwood House, the repository of Anglophile heaven. Either exhibition is worth the visit. I enjoy the cult of Frida that blossomed in the late 1980s. She is the long suffering Madonna mother of solipsistic self-reflective modern art forms, like this blog. Her oeuvre anticipated the modern taste for obsessive personality exposure and detailed confession without redemption. Her cultural genius was depicting her own interior anguish as an exotic art form. We collect her paintings not for their quality, but because she touched them. They don’t depict her; they are her. She hasn’t spawned a school of imitators of her art, but a demographic who want to imitate her style. In many ways she was early post-modern. At auction today one of her outfits would garner a substantial sum, while a suit of Diego Rivera would be a mere curiosity, or more than likely an accoutrement to Frida’s. Before I felt confident to post pictures, poems and commentaries on the Internet about anything I bought, wore, did, saw, or ate, Frida Kahlo had set a higher standard for neurotic visibility. Although her style references religious art and retablos, she doesn’t undertake religious themes or explanations. Although she was an infamously indelicate communist, she doesn’t reflect philosophy or politics. She is the body of her art. She was a true model, not a poseur. She came to her self-portraiture through honest diligence. Her beloved father was a photographer. Along with her early forays into art school and the artistic chaos of Diego Rivera’s household, she was always immersed in personal images, photographs, negatives, sketches, and x-rays. Her estate contained 6,500 photographs, mostly documenting her life. She knew many photographers, Tina Modetti, Imogene Cunningham, Edward Weston and Paul Strand among them. She was photogenic; the camera liked her, but didn’t flatter her. Her world of art was both mirror and confidante. As she learned to speak through her painting she went from gossip, to uncomfortable intimations, and then continued on in her story like the Ancient Mariner. She didn’t desire her anguish and life to be seen in a larger context, but an ever smaller, more personal one. Her artistic genius seems beyond intimate. The physical dimensions of most of her paintings are generally small, nearly miniatures. Her catalog includes only 143 paintings, 55 are self-portraits. Rembrandt by comparison made approximately 500 paintings and 400 etchings. He painted nearly sixty self-portraits. Magdelena Carmen Frieda Kahlo y Calderon, whoever she was, has become the diva Frida who ever we need her to be. That’s the nature of popularity; some artists become stars like singers. When Bruce Springsteen sings “I gotta house full of Rembrandt”, he reveals nothing about Rembrandt, but we know what he means to signify about his character. Rembrandt’s name is a synonym for the more frequently misused masterpiece. Masterpiece is a term similarly borrowed and abused. It originally referred to the single piece of work that demonstrated that artist’s mastery of his skill, such that he could become a ‘master’ of his own studio. It was more like a graduate thesis. What it generally now refers to is the pinnacle of an artist’s work, an ending, something that can’t be improved…how it relates to Masterpiece Bar-B-Que Sauce, I don’t want to guess. Before (and after) Frida I pursued the work of the currently less popular, Diego Rivera, and his fellow Muralistas. I was fortunate enough to be able to travel around Mexico and visit murals and collections. In Cuernavaca there is a fine Rivera mural “Historia de Morelos y Cuernavaca, Conquista y Revolucion” at the Palacio de Cortez . It was designed and painted in the gallery of a municipal building, which had previously been a fortress residence constructed by Cortez in 1525, on the foundation of an Aztec tax and tribute collection structure that the Aztecs took over from the Tlahuicas. As a palacio it had a busy history besides Cotez and briefly his son, it housed the Emperor Maximillan when he toured, and Jose Morelos, when he was a prisoner during the Mexican War of Independence. Rivera’s fresco illustrates local history beginning with the brutal arrival of the Spanish, the enslavement and conversion of the Mexican people and ends with Zapata leading Cortez’s white horse. The year painted it, as well as two other murals in San Francisco, he prepared a major retrospective for the Museum of Modern Art in New York and was expelled from the Mexican Communist Party. To put in our context, it’s the year after he married Frida. While I was in Cuernavaca, I also visited the overflowing jewel box of the Brady Museum. It is a converted monastery that now houses among other artwork, a painting by Frida Kahlo. It’s a rare gift to share that kind of intimacy with a Frida Kahlo painting. Seeing her work in a museum is like kissing your lover in public, it’s just a different experience. The Brady was the first (and last) place I had an opportunity to sit alone in a small parlor for as long as I wanted with a Frida Kahlo painting. It was “Self-portrait with Monkey”. There are six autorretratos including Frida and various avatars of Fulang Chang, her pet monkey. The first, “Fulang Chang and I”, had an accompanying mirror and was meant as a gift to a friend. It was in the catalog of her first New York show in 1938 and sold for $300. It is in the collection of the MOMA. The painting’s popularity brought her commissions for more versions. One of those currently resides in the Albright Knox collection. Another was sold at auction by Sotheby’s in 1979 for $44,000 and then purchased by pop idol Madonna for a rumored $1 million in the late 1980s. Another “Self Portrait with Monkey and Parrot” sold to the Costantini Collection for $3.1 million in 1995. It is the painting that inspired this essay. I don’t know where the others are, as much as I appreciate the ability to view them on exhibit; I hope they are appreciated privately in a bedroom. It’s not heresy to say Frida Kahlo was not an extraordinarily gifted painter. She never developed the facile, subtle skills or sophistication in composition of her husband or contemporaries that allowed them to move from one subject or style on to the next. Her strength was not in mastery of color, illusion and perspective, but in stubbornly producing an iconography of emotional exhibitionism. In a private setting her art has the quality of conversation; in more public setting it seems to be a more strident diatribe. For the majority of us its attractiveness comes as part of a public reliquary we share with other members of the Frida Cult. She’s our Dionysian psychopomp, like a dead pop star, she transmutes her artistic life of love, sorrow and rage into our lives and allows us to change our own suffering in the connection. She’s publicly and grotesquely dismembered, then returns in her thousands of forms: the painful intimacy of tattoos, dancing seductively at costume parties, a comic book heroine (see Ghetto Frida), a thousand picture books and theses, tequila, around our throats as jewelry, selling us underwear, or possessing the body of Salma Hayek perhaps her strangest portrait of all. “Self Portrait with Monkey and Parrot” presents our Frida in her traditional traditional garb, accompanied by two doppelgangers, a loving disobedient monkey and silent tamed parrot. Regardless of where you stand in relation to the painting, she will not look at you. Still as the modern viewer know how to respond, like a trained monkey or talking parrot. I seldom think about Rembrandt paintings. There was a reproduction of “The Man in the Golden Helmet” in a rooming house I lived in for a while in college. It was on the staircase landing just beyond the front hall where the landlady’s dog pack waited in the dim light for the nightly nip and growl. Once I made there, I was safe from the menagerie. Now that painting’s attribution has come into question. But mostly they seemed like images of people I didn’t want to meet and illustrations for religious texts. I’m not much different from the character in the Springsteen song, Rembrandt is a word I possess, not an experience I inhabit. My experiences with Rembrandt have been much less personal and limited to being rushed through crowded exhibition rooms, leafing through art history texts and viewing commonplace reproductions and posters. I haven’t had sunny, lunches chatting earnestly with attractive women after visiting Rembrandt’s house, or read his notebooks or expected to. The opportunity to spend time with one was unexpected. Historically he reflects the profits of exploiting the New World as much as Frida Kahlo reflects the consequences. As much as the work of Frida Kahlo is rebellious and adolescent, Rembrandt reflects power and maturity. To put that difference in financial perspective, two years ago a Rembrandt portrait quickly sold at auction for $33 million. It’s rare that one of his paintings comes up for sale, when the next one becomes available $33 million won’t cover the reserve. People collect Rembrandt paintings not so much for they express, as for the value they retain. I can barely calculate what that “houseful of Rembrandt” might cost. Nonetheless I was pleased to be in an empty gallery close to closing with a Rembrandt, let alone a famous and interesting one. So I did what people used to do when visiting something famous and foreign, I purchased a postcard. “Self Portrait, 1645…trick of perception…open, tools…two circles making a false corner…resignation, anger and judgment…mute tone…deliberately unflattering …a memento mori … stubborn humility…”. All it lacked was “…wish you were here.” The Rembrandt self-portrait at first appeared all technique and illusion, like a commercial for magic tricks of perspective. It arrived from the world before photography and presented a miniaturized image of the artist depicted as the artist. 1645 Amsterdam was the financial center of the world and Holland was in the midst of the period of great Dutch painting. Among the contemporaries of Rembrandt were Vermeer, Franz Hals, and a painter whose work is far, far stranger than Frida Kahlo, Hieronymus Bosch. The technique and materials of oil painting were growing less arcane and exotic and more accessible, guilds were being replaced by academies. The Dutch East Indies Company had generated enormous capital. It was the first Multi-National Corporation, it held a monopoly on trade with Asia and India, and was the first company to issue stock. The Dutch East Indies Company traded in spices, silk and gold; it was an exploding engine of fortune for a whole new class of patrons, the bourgeois, the burghers. The Dutch East Indies Company paid 18% dividends , but only calculated them every ten years. People borrowed against assured prosperity. Amsterdam‘s real estate values leapt exponentially as traders ambitious to make ever greater fortunes crowded the city. It was a city of limited space, they built and purchased town houses and apartments at inflated prices. They had no opportunity to demonstrate their success by estates or terraced gardens. Instead their conspicuous consumption was spent commissioning and owning paintings. Images. They wanted to decorate their walls to demonstrate their wealth and taste. Their demand and capital created a boom market for art…much like New Amsterdam during the time Mr. Springsteen wrote “Ain’t Got You”. Traditional religious art and themes still accounted for some commission, but they were limited to private homes by the Calvinist restriction of decorative art in churches. The Reformation notion of idolatry and anti-Catholic sentiment changed Dutch painting. There were no giant frescos or altarpieces; it was all retail. This market adjustment produced many of what were termed history paintings, illustrations of biblical, allegorical, historical or mythic events decorated homes much as we might enjoy watching The History Channel in your friend’s new media room. As expected there was a growing market and accessibility to personal portraits, family portraits and group recognition in the Dutch invention, the group portrait (think of The Dutch Masters cigar box illustration). A burgeoning market grew for genre paintings showing daily life in houses, inns and on streets. Seascapes and landscapes were in demand. Still life painting began to express not vanitas, not the fleeting impermanence of life, but shopping lists of possessions. A short, rough catalog of these paintings (excluding Bosch) would be very much like flicking through the images on someone’s iPhone, only people would display their lace on their collars. Fortune is always complicated. A century before the Netherlands had been a Roman Catholic Spanish colony struggling under the Inquisition. The Dutch rebelled. They converted to Calvinism under William the Silent. What ensued was The Eighty Years War which ended in the Peace of Westphalia guaranteeing both national and religious sovereignty for the Netherlands. Suddenly it was a country at peace, officially Calvinist and wealthier than anyone could have imagined. How could they not have felt among the Elect? Faced with the dilemma of the spiritual austerity demanded by their national religion and their personal wealth, the Dutch resolved it by demonstrating their riches in the subtle qualities of dark business suits, equivocating wealth and salvation, and generally condemning public displays of luxury or leisure of as sins against pride. They may have been neo-pre-Post Modern conservatives. This complicated social decorum, for example restricted portraits from depicting their subjects standing too upright, or appearing proud, or showing the symbols of their trade. Which brings me back to “Rembrandt van Rijn, Self Portrait 1665”. 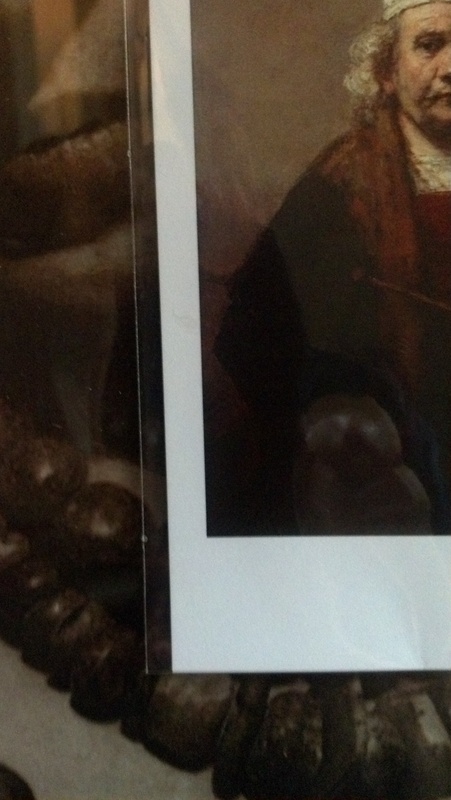 Here is Rembrandt standing upright before the viewer holding his brushes and easel. Sixty-one years old, nostrae aetatis miraculum, roughly, the miracle of his age. No false pride here. Thirty years before his self-portraits reveal a dandy with a velvet beret and poodle. It was lifetimes away from the shadowed figure dwarfed by his easel in his first self-portrait. But in the preceding decade his first wife and three of their four children had died. He had lost his fortune, his art collection and possessions to bankruptcy. In order to continue painting he had signed over all of his business dealings to his common law wife, Hendrickje, and son, Titus. He had to sell speculative shares of his commissions to investors and creditors and subsequently received only fractions of their sale price. He sold his wife and children’s grave and headstones. Hendrickje died of the plague and he buried in a rented grave. His largest painting “The Conspiracy of Claudius Civilis” intended for the Amsterdam Town Hall had just been returned, unpaid. Nonetheless he continued finding still another commission and kept painting. He stands painted in front of two perfect circles that provide an illusion of a corner. The figure gazes directly at the viewer wherever the viewer stands. It’s an old trick of perspective, but here it creates an insistent intimacy and draws attention to the expression of his face. He appears (pardon the pun) disillusioned. He shows himself as a man washed in an unexpectedly harsh world and left, but not as its victim. His gaze continues, beyond the mere trick of appearing to meet the viewer’s gaze, but stares at the world outside his self-made frame, into our world. At the end of our Tuesday afternoon visit, he doesn’t seem as world-weary and sad as prophetic (He did paint himself as St. Paul in 1661). Rembrandt hung on a gallery wall, in a city that didn’t exist becomes a mirror of our world. He seems to collect us more than remain a possession in the Kenwood House collection. His self-portrait, like Frida Kahlo’s, instructs us finally not to look at him, but to see ourselves as part of what is collected here.